The boreal forest (also known as the taiga) is a type of terrestrial biome most commonly found in Canada, Russia, Alaska, and northern Europe. This biome can easily be identified by the coniferous forests that cover it. 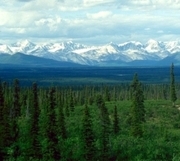 The climate in boreal forests varies greatly, but generally can be described as a very harsh type of continental climate. This means that the temperatures range from very cold to moderately warm. The weather is split into four distinct seasons in a boreal forest: a cold winter, milder spring and fall, and a warm summer. Precipitation levels tend to be low in boreal forests. However, since evaporation levels are low in boreal forests, the precipitation level is usually higher than that of the evaporation, which allows a variety of species to grow and thrive in boreal forests. Although boreal forests usually have climates too harsh to support large human populations, they are home to a variety of other animals that have adapted to these climate conditions. Animals commonly found in the boreal forests include small rodents (such as mice, rats and squirrels) and larger herbivorous mammals (such as deer, moose, reindeer, and caribou). Carnivorous mammals found in boreal forests include wolves, lynx, grizzly bears and foxes. A variety of birds also call the boreal forest home. Carnivorous birds such as eagles, owls and hawks hunt on the many rodents that live on the forest floor. Other birds found in boreal forests include sparrows and warblers, which migrate south for the winter and return north in the summer.